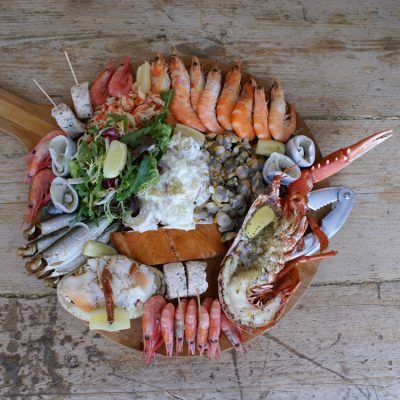 A seaside Seafood Restaurant serving local Crab, Lobsters, Mussels and Oysters when available and offering a vast selection of Fish dishes and Platters - we have a Great selection of Gin, Wine and Cocktails to compliment our Monthly dishes. All 7 of us had a wonderful meal, just a bit dubious about pairing skate wing with parsnips!. However, we will return and that is a promise. Food and  service was excellent. Would 100% recommend a visit to anyone. The seafood platter to share was amazing. It's a shame we live 120 miles away otherwise we would be here at least twice a month, it's that good. We dine here regularly, but the menu is continually refreshed, and lots of creative specials. Very high standard of food and service. Wells Crab House just keeps getting better and better! Every time we visit the menu changes. The choice of different dishes is interesting and varied. The seafood itself is incredibly fresh and is cooked to perfection by the chef. Despite the restaurant being virtually full, the service was attentive and friendly. Overall, another exceptional dining experience. Great food/wine/gin and excellent friendly service- as always! Our favourite restaurant In Norfolk . Excellent all round from the moment you walk in, friendliness, service and the food fantastic. We visited twice during the Easter school holidays, the service and food were excellent on both occasions . Highly recommend. Lovely atmosphere, staff all friendly , helpful and full of passion for the food and drink they were serving. Food was exquisite in both presentation and flavour. Loved the spit roasted pineapple gin so much have ordered a bottle! And nice touch , thanks for my birthday card. Lovely lunch - relaxed with good service and excellent food. Excellent service and lovely food. I would strongly recommend the restaurant. Friendly, helpful, knowledgeable and efficient service in a relaxed atmosphere. Food met the great expectations and the Norfolk wine was superb too. Definitely a place to re visit and thank you for a great experience. Great meal. Lobster was delicious and loved selection of appetisers. Service very good. The additional parts of the meal, ie, the lemon rice (which was tepid) and thai rice with fruit were disappointing, a strange sauce spoilt the dish. I would have preferred the meal to be hotter too. My wife's halibut was perfect but the dauphinoise potatoes with crab and coconut layers were bland and a bit tasteless. Again, the meal wasn't hot enough. Both dishes were tepid as if they'd been prepared too hastily. Faultless. Birthday cards are a lovely touch. Already recommended.Hope to return soon. This was our second visit,  superb gets better really helpful and friendly staff, great local food well done to all the staff. I cannot add anything to any of the reviews I have done before, simply because they must all be the same, owing to the fact that nothing changes in that  the food is always amazing  and the staff are second to none. We love going to Wells Crab House. A brilliant experience !!! !